Abdullah Ibrahim, South Africa’s most distinguished pianist, will be presenting a once-off Master Class as part of his Solo Piano Concert Series in The Fugard Studio Theatre in January 2019. 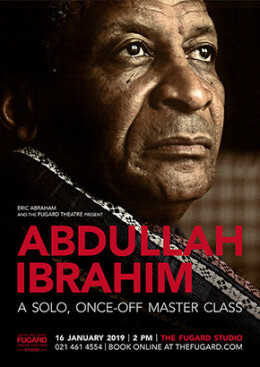 On Wednesday 16 January 2019 at 14h00, Abdullah Ibrahim, world renowned musician whose career spans nearly seventy years, will take audiences through his process of composition and performance in this once off Master Class. Limited to 100 seats, tickets cost R300 each and can be purchased from www.thefugard.com or from The Fugard Theatre box office on 021 461 4554. Wheelchair access to The Fugard Studio is limited and requires assisted entrance which can be arranged in advance with the Theatre. Visit the cosy ground-floor bar for a before and after show drink and delicious snacks. If the weather plays along, enjoy the panoramic city views from The Fugard Theatre’s fantastic rooftop bar. There is secure parking for a small fee directly opposite The Fugard Theatre in Harrington Square.